Lots of citizens who wrote to Juncker or the DG Grow recieved emails with the following contents. 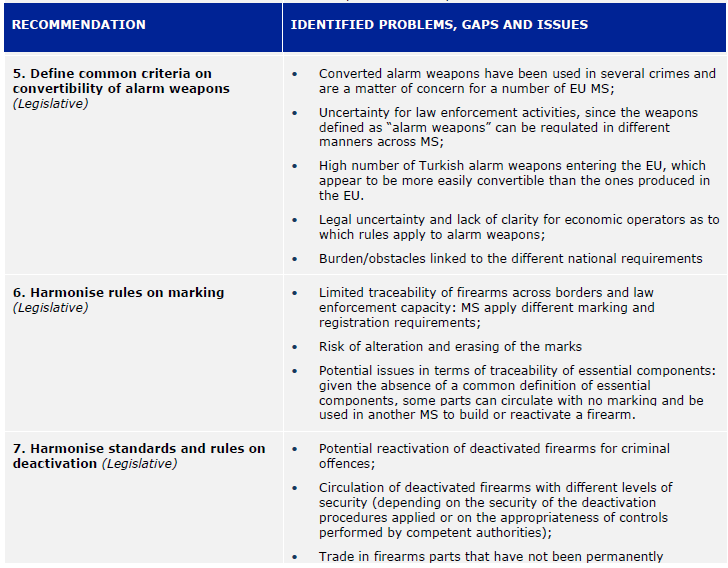 the European Commission proposed, on 18 November 2015, a revision of the Firearms Directive (Directive 91/477/EEC as amended by Directive 2008/51/EC) to reinforce its security aspects in order to tackle these challenges. 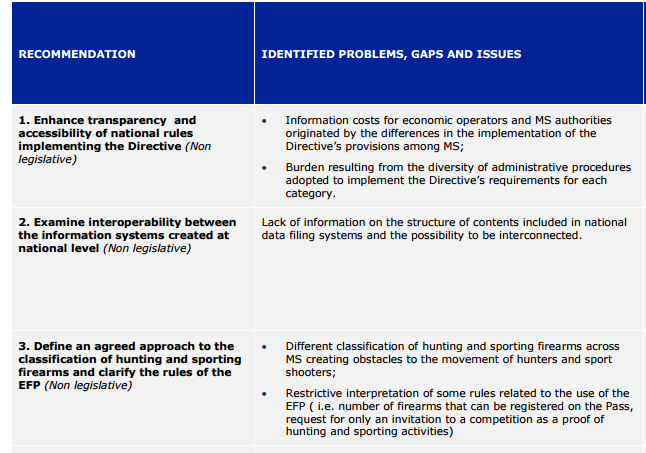 This proposal is based on the conclusion of 3 studies the European Commission has recently conducted evaluating all provisions of the Firearms Directive. The Commission presented a report on the implementation of the Directive on the basis of these studies to the European Parliament and Council together with the proposed measures to the Firearms Directive to address the identified gaps. 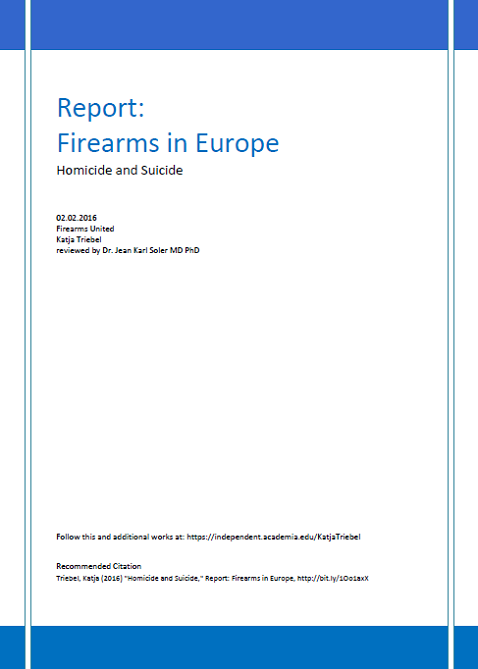 This report notably indicates that over the last decade, 10 000 homicides have been committed in Europe with firearms. In certain Member States, a majority of homicides have been committed with legal firearms. Moreover, there are nearly half a million firearms inside the EU which have been registered as lost of stolen from the mid-90s up to 2014, and which remain unaccounted for. The report also highlights the risk of conversion of alarm weapons and the fact that certain semi-automatic firarms are particulary dangerous and can be transformed into automatic firearms. This proposal is based on the conclusions of 3 studies – but these three studies only recommends three legislative actions on marking, deactivated guns and alarm weapons. They do not evaluate all provisions, but only a few. These studies do not recommend prohibition of some types of firearms or the distance sell by internet. We read and commented all three studies. When you download these PDFs, look at our comments. And the most important priority which would ease the burdens of legal owners, traders and manufacturers was ignored. Instead of simplifying the categories (e.g. deleting B7 as it was only introduced in 1991 because of a German ban which has been repelled in 2003) EC invented new categories (A5, A6, A7) without impact assessment. FIREARMS UNITED researched in homicides. Between 2000 and 2012 almost 3 million people lost their lives by external causes in Europe (see chapter 2). Less than 2,4% were firearms-related suicides (see chapter 5). Less than 0,5% (12.076) were firearms-related homicides (see chapter 7). Both rates decreased by more than 30% in the last decade. There is no evidence of 1000 annual homicides committed with legally held firearms. Read more: How to decrease firearms-related death? 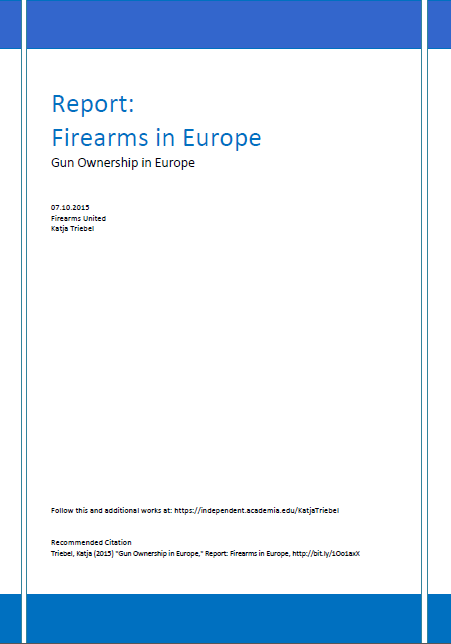 FIREARMS UNITED showed in its „Gun Ownership in Europe“ in chapter 2.2.3.3. Former legal stolen guns with two Swedish studies and official data by the German government that most of the reported firearms and parts are not stolen, but inventory losses of the firearms registries. The Swedish study also research on the impact of stolen firearms on gun crime: less than one former legally held firearms was misused for firearms related homicide per annum. Also, the report indicated that there have been a number of incidents when weapons that have been deactivated in line with the current rules have later been reactivated for criminal use. The problem of inadequate technical guidelines for the conversion of firearms to blank firing acoustic firearms and for the deactivation of firearms has been known since the first report of 2000. The issue was mentioned again in the next reports of 2010 and 2012. But the EC waited until 2013 in order to commission a study which was published with an impact assessment on deactivated, blank firing and acoustic weapons in summer 2014. EC ignores the proven fact that what is missing is serious enforcement of the Directive to tackle these criminal offenses. Read more: EU, we have a problem – but you hit the wrong targets! EC’s argument „the fact that certain semi-automatic firarms are particulary dangerous and can be transformed into automatic firearms“ is invalid. What says EC’s Evaluation about this topic? There is not enough data! Since December 2014 nothing has changed in data. There is no new in-depth analysis with impact assessment for semi-automatic firearms or their so called „dangerousness“. In the recent terrorist attacks no registered semi-automatic firearm was transformed but unregistered expansion weapons. One of three studies researched on these weapons and gave recommendations in July 2014. Unfortunately only the common guidelines for deactivated weapons have been established by now. No guideline for alarm, salut or expansion weapons has been established. The statement „some semi-automatic firearms can be transformed to automatic firearms“ is true for a few firearms of category B7 and other firearms of category B.
that automatic firearms which are owned by museums or collectors are most dangerous. There is sufficient data that most B7 rifles cannot be transformed into automatic firearms. Without data of misuse no type of firearm should be labelled as „most dangerous“. Without data of misuse no legal firearms should be confiscated and destroyed. What can we do to prevent this? Who should I contact? Keep it short, simple and polite.